Today, I’m partnering up with timeshel to improve my current workspace and wallspace! It’s been quite a while since I posted any sort of DIY project, so today’s project is way overdue! To jump back into crafting, I came up with a super simple way to print out my photos that I’d been hoarding on my phone and display them in a more modern collage that fits my design aesthetic. Hop through to the full post to learn more about the timeshel subscription service and see the end result of my weekend project. The timeshel app (available for iOs for free on iTunes/Apple Store) gives you two different levels or subscription service: 10 prints a month for $5.95 or 30 prints a month for $14.95. I chose the 30 prints a month since I have a major amount of photos saved on my phone right now. I can’t even tell you where my point and shoot camera is right now. I pretty much take all of my candid snaps using my iPhone which means I never end up having any printed photos from all of these moments. So I love the fact that I can have at least 10 prints a month that just start at such a low price point! For me, I knew that my office wall was lackluster, and the typical collage pin-board wasn’t up to par. So when I started looking through the app to decide which photos to print first, I went with my favorite snaps from the past year blogging. They range from outfit posts, home posts, travel posts and Odie even made it in there too! With all my photos always going onto the blog, it was fun to finally get them printed for once! I bought a 24×36 poster frame and laid out my prints in an arrangement I liked. I even pulled out my old school T-square from design school to make sure all my photos lined up perfectly. Using double-stick tape permanent tape, I quickly adhered them into place and voila, I had my personal wall art ready to move into my office. I’ve used other iPhone printing services before and wasn’t too impressed with their quality, but timeshel’s prints are exceptional. I’m sort of a photo snob especially when it comes to paper and color quality, and I’m very happy with how these came out. Because the quality is so great, timeshel would be a great way to capture memories as a gift for someone. Especially family photos put into a collage type project like the one in today’s post. How would you display your timeshel photos? Do you want to see more DIY posts soon? I’m back with today’s second post! This morning was all about WHY I decided to reboot my health with a cleanse, and now I’m sharing photos from Raw Republic’s New Orleans location and commentary on my first juice cleanse experience! The first day was, in fact, the hardest, so I’m super glad I wrote notes out throughout that day to document exactly what was going on bottle-by-bottle. Before I started this cleanse, I had no idea the work involved! It’s not just drinking juice. The juice must be prepared correctly using cold-pressed methods as to not lose the nutrients. You are also encouraged to dry brush your skin to assist in the cleansing process as well as take mineral salt baths to help the toxins leave your body through the epidermis. The whole journey has been so educational for me! I’ve even picked up dry brushing as a normal habit and have been doing it once or twice daily even after the cleanse ended. Thank you, thank you to Sheena of Raw Republic for this greatly insightful experience! I’ll actually be going back to Raw Republic this weekend to pick up a second set of juices (not for a cleanse, but to integrate into my everyday meals)! Today is Day 1 of my first ever juice cleanse. I’m writing this while sprawled across my couch because I only have the energy to lay here. I bet you thought that doesn’t require energy, but I’m now pretty certain it does. So, I hope I can read my handwriting when it’s time to write this… let me start at the beginning. Bottle 1 – Daily Detox I’ve had this lemon cayenne concoction before, so I knew exactly what to expect with this one. I drink it pretty regularly, so my day proceeds as normal from here. Bottle 2 – Green Smoothie I’ll be honest, I expected this to be absolutely horrible. I actually liked it and drank the entire bottle like no big deal. Maybe this juice thing isn’t so bad. Bottle 3 – Snack It’s now lunch time, and my stomach knows it. This bottle says “snack,” and while it’s a pretty good cinnamon almond milk, I’m craving my real snacks. In my snack drawer. Someone in the office has popped a bag of popcorn, and I feel inclined to find them and punch them in the face. I never realized how many times I reach for my snack drawer. Bottle 4 – Big Green Another green bottle, another assumption that this will result in something gross. Again, I’m pleasantly surprised. Or maybe my tastebuds are starting to be affected? I didn’t quite finish this one though. By the time the workday is over, I have about half of it left and am just excited to go home. Bottle 5 – Purple Drank I am home and I am HANGRY. I also know why there was a tongue scraper in my cleanse kit. Mine feels like it needs to be scraped. I give up on this one almost immediately. Not because the of the juice though, I’m just being dramatic about not having food all day. Bottle 6 – Big Orange This bottle is magnificently orange or my eyes are under cleanse hypnosis. First thoughts – carrots. I hate carrot juice. This cannot be good. Big Orange is surprisingly okay though. Even Jordan tries a swig and says he likes it. I think it’s best for me to go to bed without giving myself the opportunity to see him eat dinner. Day 2 is SO much easier than yesterday. It’s Saturday, so I can stay home and not see my coworkers walk by with their popcorn bags or candy. I don’t have the temptation of being surrounded by multiple snack drawers. Plus, our pantry is a barren wasteland right now. I can keep physically busy around the house to keep my mind off of food. Day two is a breeze! I’m feeling super confident and even went out to dinner with friends and brought my juice with me. I think I might have even said that I felt like I could juice forever. This must be that period of time they talk about where you feel really great during the cleanse. I don’t need food! I need food. My sister is in town and suggested brunch. We went to our favorite brunch spot – me with juices in hand. She ordered some egg masterpiece, and I ordered a glass of orange juice and a glass of grapefruit juice to have in addition to my bottle of green smoothie. The waiter thinks I’m a psychopath. Do I have a crazy look in my eyes? Maybe. It’s also Oscar night, and everyone is on social media posting snacks and champagne and other food posts… Almost there though. I’ve come way to far to mess it up now. And just reminding myself of that gives me another boost of confidence to drink my bottle of beet red juice before heading to bed. In review, was it hard? It wasn’t as hard as I thought it would be. I’d say getting past Day 1 without sneaking a snack or two is the most difficult part. Once you get past that first day, you’re too invested and proud of yourself for making it that full day. Your confidence in cleanse success will really help you make it through Day 2. Day 3 will be difficult but knowing it’s your last day is a what will help you be successful. Do NOT have anything big planned for the days you cleanse. My mind was a tad foggy without my coffee, and there are times during the second and third day when I just wanted to take naps. Not having any big plans over the weekend was super helpful because I didn’t have any pressure to tackle any big projects. Do NOT plan on seeing very many people while you are cleansing. I was super moody and anyone questioning me about my cleanse was in the line of fire (mostly Jordan). Do talk to your significant other before you start. Jordan had strict instructions about not eating in front of me. Do your research about how to prepare for the cleanse and how to eat right after the cleanse. You can’t dive back into burgers and pizza without totally doing a number on your insides! Sheena from Raw Republic provided me with a detailed information sheet outlining my personal cleanse, how to prepare and what to expect which really helped me create a realistic view of my cleanse. If you are considering a juice cleanse, I would definitely give Raw Republic my full recommendation! You can also head over to Haute Off the Rack to get more on Raw Republic + her juicing tips! One of my main resolutions goals for 2015 was to be better at time management, so I had many a brainstorming session on ways that I could cut down on unnecessary wasted time. What it all boiled down to was that I needed to create a new world of organization for myself. Lists and endless Post-It notes were not going to cut it any longer. By creating a more streamlined blogging process for myself, I would have more time to do… well all the things that need to be done + have some free time for myself. It’s time for major organization to save my sanity. See the four ways I’m doing just that with a little help from HP in today’s full post. Getting a wardrobe rack specifically for items that I want to share on APoL seems like such a no-brainer now that I have one. Before, I’d have them hanging around our bedroom so that they would always be in sight. I knew if I put them in my closet, I’d either forget about them, wear them and potentially mess them up before I shot them or they would be sucked into my closet black hole. Now they are still in sight and designated in their own area. Jordan is super relieved about this one considering our bedroom is a whole lot tidier. The same idea above applies to accessories that I want to share with you guys. What once ended up in jewelry bags on top or inside of our dresser is now stowed on accessory carts. These carts are not only reserved for jewelry but for any other item that I want blog about. They are right beside my desk for easy access when I’m writing my posts as well. Once they’re blogged, I can remove them from my cart! I can’t even count how many times that I’ve forgotten to include items in posts because they were smaller and I missed seeing them on my dresser. Visually having them right where I can see them now cuts down on my searching time! Oh my, the number of notepads I’ve gone through! I jot down tons of notes and ideas, but it all ends up written down in different places. Most times, I’ll have part of it written down and then the rest of it is somewhere in an email. I waste a lot of time going back to read through emails or find a specific set of notes. And crap, which notebook or notepad did I even write it in? I’ve seriously got four different notepads going on. At some point, I decided I had to create my own notepad to keep everything in one place. A place for all the notes about a specific post, a specific brand or just an overall idea about a future post. These are the sneak peeks of a notepad I’m actually launching very, very soon. (I’m showing these photos because it’s not actually the final product – this was my test notepad to tweak and fix!) I also heavily rely on a content calendar year round to help me organize posts and content ideas! I am at a desk all day, but that doesn’t mean I can get everything accomplished inside my office. I need something on-the-go but more than just a smart phone. That’s where the HP x360 comes in. With its four different modes – laptop, tablet, tent and stand – I’m able to multi-task away from my desk in ways that I never could before. I can use it as a tablet to browse my Pinterest boards for outfit ideas while I’m planning for photoshoots. I can use it as a laptop while traveling out of town or in tent mode while I’m catching up with my DVR and catching up on emails (by far my favorite way to use it, haha). It’s lightweight, super thin and fits into my Parker satchel, so I can bring it anywhere with me! Oh and did I mention the keyboard is removable, so if I need to just carry it as a tablet, I totally have the option to do that too. HP is literally bending (and removing) the rules of typical laptop/tablet technology! HP is hitting the road with singer Meghan Trainor this month to cover her US tour and help it come to life in the “All About That Tour” behind the scenes videos. From her hair to her choreography, there will be video clips of all the action to help fans get a first-hand glimpse of the tour. (Hosted by a team of fabulous co-stars including a personal favorite of mine Bri Emery of Design Love Fest!) There will also be a fan-generated documentary along each tour stop. Footage from Vine, Instagram, YouTube and more will be stitched together to create a tour documentary solely made up from fan footage. You can follow along with “All About That Tour” by watching the episodes or following @hp on social media for updates! This post was sponsored and inspired by HP, but all opinions (and organizational tips) are my own! Any questions about where to find anything you see in my office, please email me at apinchoflovely@gmail.com or see the links below for furniture! I cannot say this to be true about ALL loop giveaways, but I can say this to be true about the ones I participate in – They ARE real and people DO win. I know this because each and every blogger involved is putting in money towards the final amount. The gift card is not provided to the bloggers by the brand that the gift card is from – the bloggers are paying out of pocket for the giveaway item. I also make sure to tag the person that has won in the very last comment letting everyone know that the both winner and account are real. Of course, the main reason to host any giveaway is to reward our followers! But blogging is a community too. By coming together to host loop giveaways, we are supporting each other by sharing each other’s accounts – accounts that we’d love to introduce to our own followers. Before I participate in any loop giveaway, I ask to know all the bloggers participating to make sure that they are accounts with high quality content, beautiful photographs and are in line with A Pinch of Lovely’s audience. New followers that I gain by these giveaways are never required to follow APoL for any given amount of time. If they follow and then enjoy my content, then we’ve both benefited! I cannot emphasize enough, that bloggers cannot be successful without the support of one another, and loop giveaways are a great way for us to introduce each other to a new audience we wouldn’t normally reach. In fact, I LOVE finding new bloggers to follow via loop giveaways! So while I know some skepticism may be out there about this type of contest, I hope that I have at least helped give some insight on my end as to why I participate. If you have ANY questions about loop giveaways, please email me at apinchoflovely@gmail.com! Another part of staying in the French Quarter is dressing chicly for all of the unique venues you’ll find in New Orleans. Bevelo Gas & Electric is a stunning and historic location for many engagement parties and social receptions. A wall of beautiful copper lamps spans the space and creates an ambience like no other! 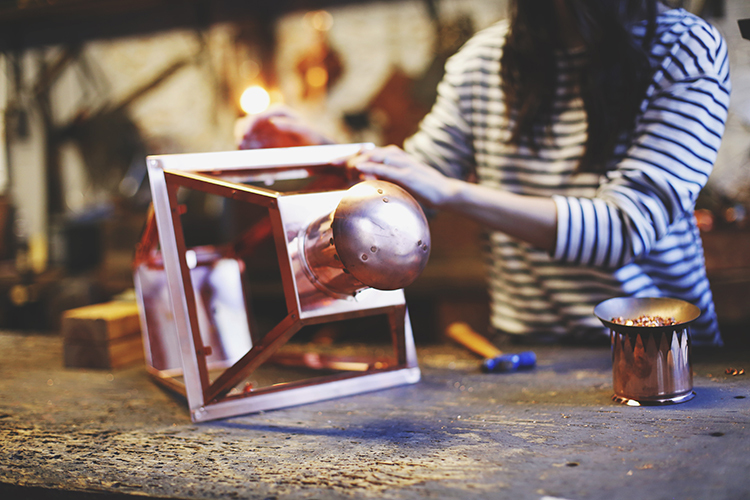 Utilizing a hand-riveting technique, Bevelo created what is now known as the original French Quarter Lamp with every single piece made by hand. So see more of this outfit and see more of Bevelo’s workmanship, keep reading the full post! For some color, I thought the Tory Burch Thea mini bucket bag would be a gorgeous shade to pair with the neutral palette. (Plus, it matches my current favorite polish color!) For jewelry, I wore my new set from Ricochet Rounds. It’s a matching necklace and ring, and you’d never know that both are made from bullet shells. I had to take a second glance too because they are, so pretty! Some styles even feature a Swarovski crystal making this collection perfect for any southern belle! I wear my ring all of the time, so if you’re following @apinchoflovely on IG, you’ve already seen this gem a few times! For more info and styles, visit the Ricochet Rounds website. ps. Don’t miss the first post in this French Quarter series and my other Black Turtleneck outfit post.